Whether you’re new to the world of paintball or regularly jump into the thick of battle, the right clothing is important. Many new players make the mistake of wearing clothes that aren’t made for the game, ruining their first experience. Like all intense sports, the right attire will make all the difference in your performance. 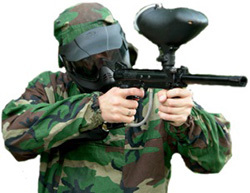 The main goal of paintball clothing is protection and comfort. 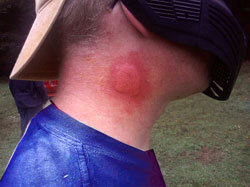 While the impact of a paintball is generally safe, it’s a good idea to minimize as much pain as possible. Thick clothing will ensure that you can take the hit and keep playing. That being said, you want clothes that provide you with optimal comfort. Cumbersome clothes will limit your moves, making you a vulnerable target against the opposing team. One thing to consider when choosing clothes is the playing environment. Different types of terrain call for different clothes. Furthermore, unfavorable weather conditions can create slippery surfaces and difficult hazards. It’s important to check out the playing field and monitor the weather when preparing for a game. To get you started on your preparation, here’s a guide for what to wear during a game of paintball. One of the most important pieces of gear you can have on the playing field is head protection. 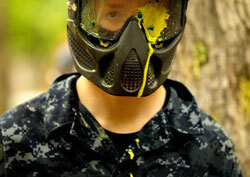 With paintballs flying through the air at around 200 miles per hour, a hit to an unprotected head can be very dangerous. Helmets and goggles are commonly used to protect the face and head. Helmets always cover the face. Some of them provide protection to the entire head. Goggles will cover the eyes and ensure that an accident doesn’t happen. When finding a helmet and goggles, it’s important to find an option that’s comfortable. They should fit snug and provide ample protection. The downside to helmets and goggles is that they can fog up and cause discomfort as the temperature inside rises. There are many options available with built-in ventilation. This will keep you cool and prevent mist from forming. Seasoned players use an additional layer of protection, such as a hat. Beanies will add some cushion to the back of the head. This is especially important if you choose to go with a face mask rather than a full helmet. Hoodies are another option. They provide some padding to the back of the head and are easily removed as it warms up. The neck is a vulnerable spot that can be very painful if hit. Neck protectors are available and provide ample protection. However, they can be very rigid and uncomfortable. They are known to limit head movement. Another option is to wear a bandana or turtle neck sweater. While it won’t provide as much protection as a protector, it will provide some cushion and lessen the blow. They can also be removed at a moment’s notice if you find that it gets in the way. Turtle neck sweaters will provide a bit more protection than a bandana, but they don’t provide as much versatility. When it comes to the upper body, layers are key. Layers not only provide extra padding, but they can be adjusted based on comfort level and temperature. You can easily add or remove layers between games to ensure you are perfectly comfortable. A long sleeve shirt is great as a base layer. This should be followed by another long sleeve shirt for padding. Additional layers can be added based on comfort. These should be topped off with a thick jacket, such as a hoodie. Depending on the weather, water-resistant jackets will also work. Some players also opt for jerseys to help with identification during the game. Padded shirts are available specifically for the game. They are similar to compression shirts. However, they have strategically placed pads throughout to lessen the impact of the paintball. They take the place of multiple layers. However, they can easily weigh you down. Specialized garments are great for serious players. 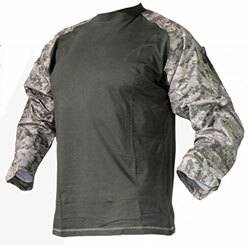 Camouflage tops made for hunting are thick and protective. They also help give you the upper hand during the game. Vests provide extra protection on the torso while allowing players to take a bit of extra gear with them on the field. While most don’t realize it, the hands are some of the most vulnerable parts of your body. They are always exposed as you use them to point the gun. A hit to the hands is extremely painful, especially at close range. Hands are tender and sensitive, so it’s imperative to find a great pair of gloves to wear during the game. 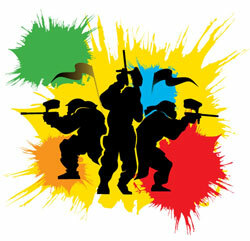 Gloves that are designed for paintball are the ideal choice. 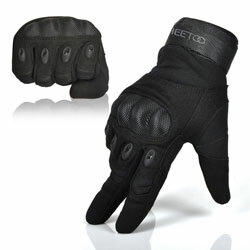 They provide agility to the fingers while incorporating a tough exterior for maximum protection. Many gloves have a tough shell similar to armor. However, the inside of the glove is made of flexible material to ensure that you can easily pull the trigger of your paintball gun. Other alternatives will also work. Football gloves and light mechanical gloves will provide great protection. Latex gloves and winter gloves aren’t the best option, as they inhibit movement in the fingers. Like the upper body, dressing in layers is a good idea. Two pairs of baggy pants will ensure that you have all of the mobility you need and ample protection. Many beginners choose to wear jeans, which can work if they are the right fit. Skinny jeans will only slow you down. However, relaxed jeans with extra room in the legs are thick enough to reduce the pain of a hit. Wearing them over a pair of long johns adds more cushion. Regardless of what pants you wear, it’s important to layer pants with thick material. It’s not uncommon to encounter obstacles that will tear thin materials. If you didn’t layer up, you will expose your leg and create a vulnerable spot. Paintball pants are the best option. They are baggy and often have padding built in. The game often involves kneeling, crouching, and crawling. Built-in knee pads make this more comfortable, allowing you to track your target with ease. Some pants are even camouflaged to decrease your visibility. 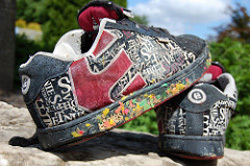 Ankle injuries are commonly experienced by paintball players due to inadequate footwear. While rugged boots may seem like a good idea, they can limit the movement in your ankles. Should you experience a fall, this can strain your ankle tremendously. The best thing you can wear on the playing field is trail runners or soccer cleats. These options have soles that grip the terrain. If it’s muddy or slippery, choosing the right treads are important. Normal sneakers have small treads that will fill up with grime in a matter of minutes, making them useless. Water resistant shoes are also a good idea. There’s nothing worse than a shoe filled with water. They’ll cause discomfort and become dangerous if you’re playing in a cold environment. In addition to the right shoes, you should wear thick socks. Thick material will provide extra cushion to keep you comfortable as you run through the field and keep your toes warm. With the right clothes, you’ll find yourself enjoying the game much more. You’ll be better equipped to dominate your competition. Not only that, but you’ll be safe and protected, ensuring that you can enjoy multiple matches.